My three children ages 6, 7 and 9 love our homeschool science class. At least twice a week during the school year we do a new science experiment. In their free time, they love to conduct their own fun experiments too. They were very excited to learn about some of the inventive experiments in the new book release, Dad’s Book of Awesome Science Experiments. From soap clouds, rock candy crystals, a banana balloon, straw balloon rocket blasters and an egg in a bottle….this book has tons of fun experiments for the entire family. 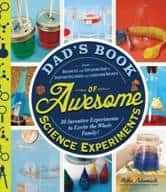 Written by Mike Adamick, Dad’s Book of Awesome Science Experiments features 30 experiments that explore chemistry, biology, physics, the human body and our planet. What makes this book so interesting for us is that it features interesting experiments that can easily be done with many common products that can easily be found around the house. The text is interesting and the step-by-step instructions for each experiment are written in a concise manner that is easy to follow and is accompanied by an illustration. We are studying energy currently, so we couldn’t wait to explore magnetic fields. There was an explanation of protons, neutrons and electrons along with interesting facts about the energy that surrounds us. In the first experiment, the kids (with my supervision) learned how electricity can “confuse a compass by creating a competing magnetic force”. Once they finished this experiment and understood the forces that made it work, they were ready to try making a stronger electromagnet using only a copper wire, a screwdriver, tape, 1.5 volt battery and paper clips. My younger children loved creating “Fingerprint Monsters” and were fascinated to learn that fingerprints are formed in utero prior to 15 weeks gestation. They even used a hand-held microscope that we have to look more closely at their fingerprints to see how it is unique just to them. I appreciate that all of the experiments are easy to follow and many can be adapted to the skill level of the child. I needed to provide minimum supervision for most of the experiments and allowed my nine year old son to take the lead while helping his younger siblings. This book has literally provided hours of hands-on learning for my children and they are having so much fun that they don’t even realize that they are learning. If you are looking for a fun way to keep a love for learning alive during the upcoming summer break then I highly recommend Dad’s Book of Awesome Science Experiments. It has a SRP of $18.99 and I currently found it on sale for only $12.89 which is a great value for this kid’s science book.